Catalonia (Catalunya) is an autonomous community in Spain that consists of four provinces: Barcelona, Girona, Lleida and Tarragona. AirVuz created this aerial compilation to give viewers an aerial tour of the most visited places in this beautiful region of the world. Barcelona is the largest city in Catalonia and the capital. Catalan architect Antoni Gaudí designed the famously unfinished Roman Catholic church, La Sagrada Familia, that you can see from a drone. Barcelona is also known for its beaches, the sunken church of Sant Roma and the island Montserrat. Next fly over Spain’s coastal region and the Costa Brava province. There are many historic sights to see in Girona. A drone pilot captured people mountain biking in Giverola. In the province of Lleida you can fly your drone in the Pyrenees or go on a kayak trip in Mont Rebei Gorge. Lastly, the province of Tarragona has breathtaking landscapes that drone pilot like to capture. Montferri is one of the most popular spots to visit because of the Our Lady of Monsterrat church. Two other locations drone pilots fly is the Ebro River and L’amettla de Mar. 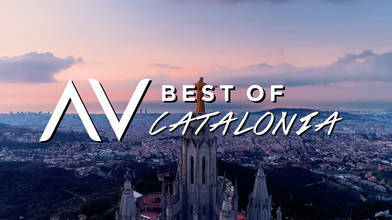 If you’re thinking of visiting Spain’s Catalonia region and want to view more drone videos, click here. “17 Best Places to Visit in Catalonia | PlanetWare.” PlanetWare.com, www.planetware.com/tourist-attractions-/catalonia-cataluna-e-cat-cat.htm. “Catalonia.” Wikipedia, Wikimedia Foundation, 28 Jan. 2019, en.wikipedia.org/wiki/Catalonia.